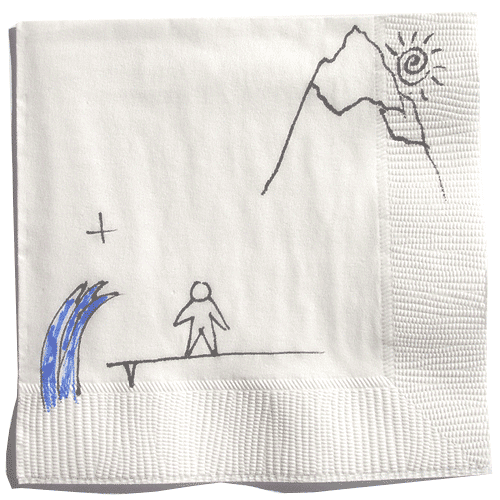 Simplify your message so that it fits on a napkin. It’s not easy. However, I believe that your ability to engage someone with your why, what and how is proportional to how clearly and cleanly you can communicate your message. When sitting down with someone new they should ‘get it’ in a matter of seconds. Too often we overwhelm people with power points, three-ring binders and slick brochures. I’ve made many ‘million dollar calls’ using ONLY a napkin. I believe it is the BEST and ONLY presentation tool you need. Every day, every training, every coaching just reinforces the power of this insight. Just for kicks, see if you can identify these industry changing businesses from the napkins below.